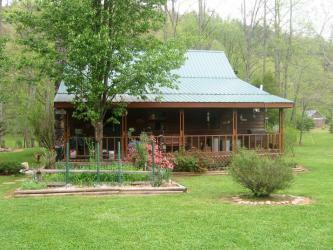 This vacation get-a-way cabin is on 21.5 acres and has a fenced area with an open barn for your horses. One area is puppy proof. So if you have them, bring them with you for fantastic mountain trail rides! The Cabin property has 1,000 plus feet on the river and there is more than 1,500 feet of riverbank that is accessible to the walking fisherman who does not want to get his feet wet. The fencing is horse non-climb wire with board on top. 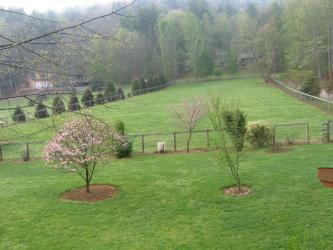 The pasture is a mixture of Fescue, Kentucky Bluegrass, Orchard Grass and Mixed Clovers. You will never have to load your horses into a trailer while you are here, since Brown Mountain, where the cabin in located is crisscrossed with mountain trails and you can also cross into the National Forest for all day rides. The terrain in this area is not steep, so it is great for riding or just long, peaceful walks. If you bring a pet they will have so much fun as they run with unbounded energy and splash in the pond or river. It is truly a pet paradise. Our Toccoa Riverfront cabin is nestled in the North Georgia Mountains, just 1/2 mile into Fannin County, this vacation home is right on the Toccoa River and backs up to the National Forest. 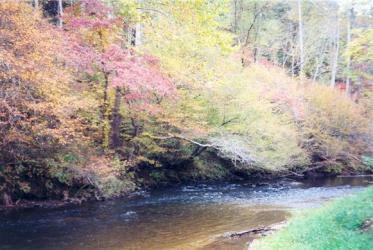 The river is stocked weekly with trout from the fish hatchery located only 7 miles away. Not only is the river excellent for fishing, but is also great for tubing, canoeing and kayaking. The Cabin has sleeping facilities for 6 people. Downstairs there is a double futon in the living room and a King Bed in the Bedroom. Upstairs there are two single beds. In a pinch, there is another couch. We do ask that you bring your own linens and towels. There is a washer and dryer in the cabin. The country kitchen is fully equipped for even a gourmet cook. This includes a microwave, toaster, juicer, blender, and all spices. We have a TV and VCR. Bring your tapes or watch some of ours. We also have television via Direct Satellite. The cabin is Cedar on the exterior and pine on the inside with cathedral ceilings and 4 ceiling fans. The fireplace is cheerfully warm on a cool night with additional propane heat for winter. Firewood is provided. You can even build a fire in summer in the outside fire ring. Pull up a chair and roast those marshmallows! For the short period of time that it might get warm in the mountains in the summer, we have central air. 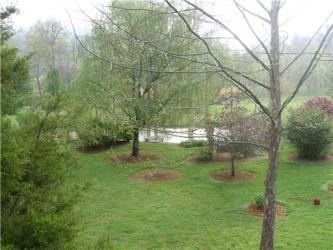 1 1/2 Acre fenced pasture for horses, riding trails right from the cabin! There is a stocked Catfish (up to 10 pound!) pond for children - catch and release only! Relax on the outside swing under the gazebo fan trellised with honeysuckle while you feed the fish and breath in the cool mountain air. $20 plus barn cleaning fee per stay.